Halloween is my FAVORITE time of year. I love everything about it. Well, minus the readily accessible, copious amounts of Reece’s Peanut Butter Cups. Those things are my kryptonite. And the unoriginal people. They bore me and everyone else. I LOVE making costumes and trying to find outside of the box ways to make a costume less expensive. I can’t stand the way that the fabric of those grocery store bought outfits feel on my skin, and they just look so underwhelming on anyone. Since my son’s first Halloween, I’ve been mixing together cheaper, store bought elements with thrift store finds and simple DIYs. They’re always cheap, no sew, and often the fabric I use is from T-shirts at thrift shops. I’ll be posting the last few years of our Halloween costumes, maybe they can help get your creative juices flowing. Starting with baby’s first Halloween. 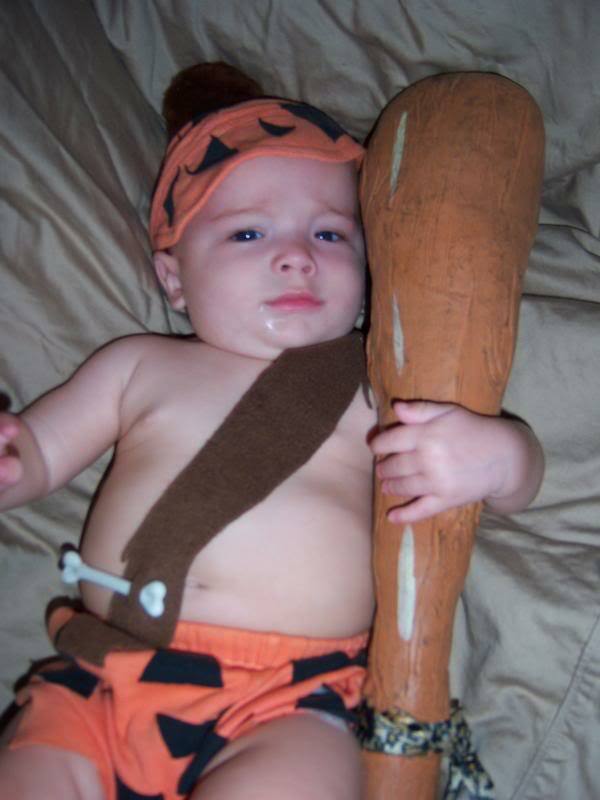 The only thing bought for this Bam Bam costume was that little bone, the pompom on his hat, orange RIT dye, and the club. I used shorts and a hat that he already had and bleached them–and get this: I was so poor back then that I didn’t have any clothes bleach, so I sprayed it until it was drenched with bathroom cleaner, then washed it in the washing machine. It’s a miracle that my son has made it this far. Then I followed the directions on the packet of RIT dye to make the shorts and hat orange. From what I remember, though, it took A LOT longer than the suggested time on the packet for it to actually get orange. It kept showing up as some crazy neon yellow. I might’ve ended up leaving it overnight. I cut tons of triangles from an old black T-shirt, and glued them on with no-sew glue. Not just because I’m lazy, but it’s only being worn once and it does the trick. I think I used hot glue for adhering the pompom to the hat. 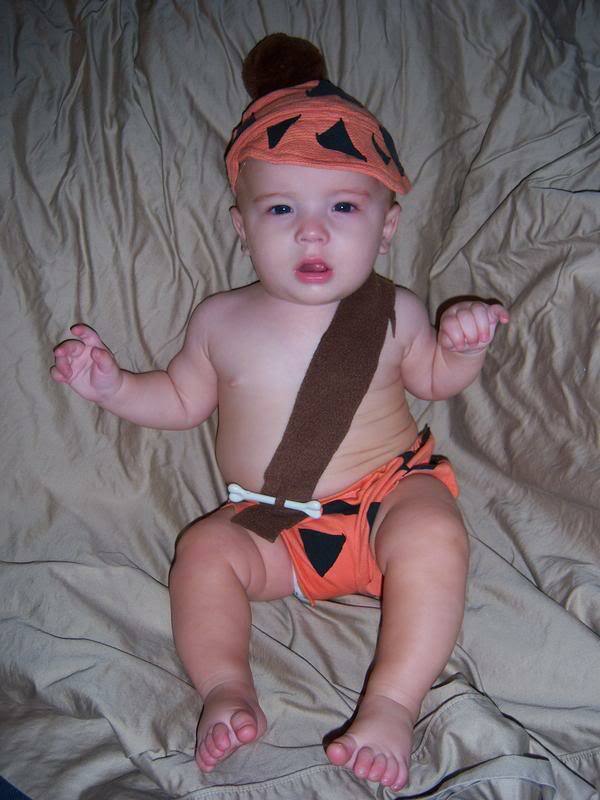 The Brown felt was left over from the Barney Rubble costume (two pictures down) that I made. I attached it to the shorts and cut two slits to put the bone through. Also, super straight forward. I just folded the brown felt in half to an appropriate length for my Barney, left holes large enough for his arms, and glued the rest of the sides. I cut a slit down the front near the neck, and gave the bottom an uneven edge. Then I cut a couple of holes near the slit and used an old shoelace to crisscross through. Fini! 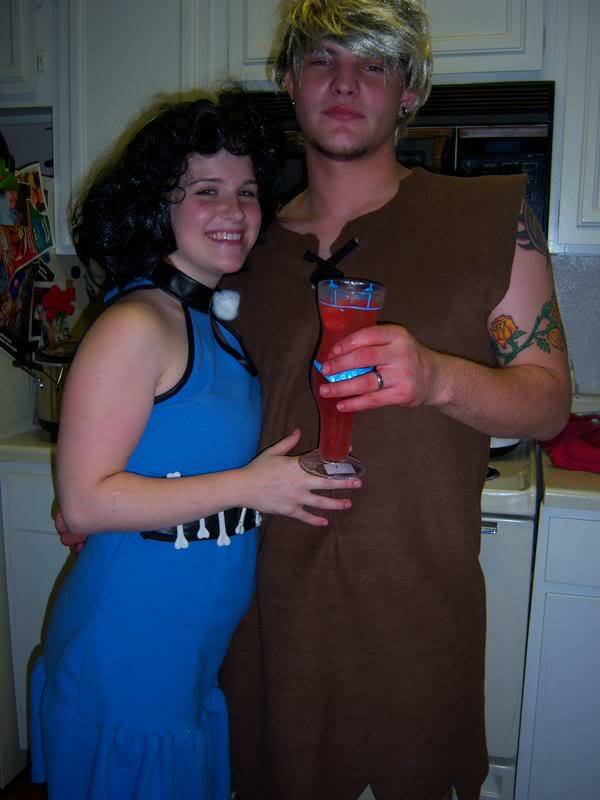 My Betty Rubble costume was store bought, for VERY cheap. It would’ve been more expensive to buy the wig separately and not get the whole thing prepackaged, so I went for it…for the last time. The cobbler is always the last to get a pair of shoes, after all. The easiest part about these costumes is that the cutting isn’t supposed to be perfect. The characters are drawn with clothes that are supposed to be misshapen furs.